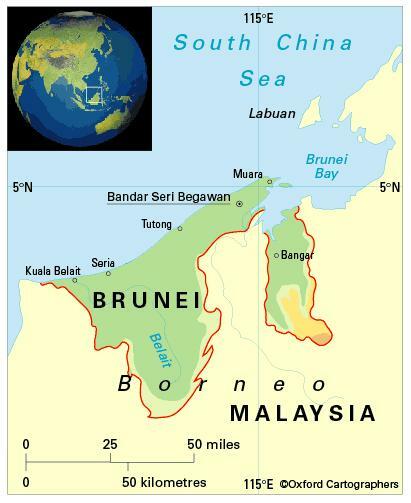 Brunei Darussalam (Brunei – ‘Abode of Peace’) is a small state in South-East Asia on the north-west coast of the island of Borneo, in the Indonesian Archipelago. Its 161 km coastline faces the South China Sea. On the land side, it is enclosed by the Malaysian state of Sarawak, which divides it in two. The districts of Brunei-Muara, Tutong and Belait make up the larger, western part of the country; Temburong district is in the east. Tropical, with high humidity and heavy rainfall. There is no distinct wet season; the wettest months are January and November. Much of the rain falls in sudden thundery showers. Environment: The most significant environmental issue is seasonal smoke/haze resulting from forest fires in Indonesia. 412,000 (2012); 76 per cent of people live in urban areas, concentrated along the coast. The population growth rate stood at 2.1 per cent p.a. between the years of 1990 and 2012. In 2012 the birth rate was 16 per 1,000 people (36 in 1970) and life expectancy was 78 years (67 in 1970). Malays comprise some two-thirds of the population and Chinese (about 11 per cent), Europeans, Indians and other races make up the balance. Brunei is classified as a high-income economy by the World Bank.